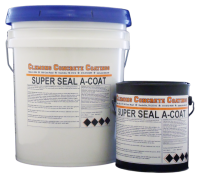 Urethane Modified Water-borne Acrylic Concrete Sealer. Can be used for interior concrete surfaces. Used for protecting and enhancing the natural substrate. Can be used over concrete stains. Surface must be clean and dry. Clean and remove dirt, oil and grime if needed. Surface must be free of other coatings, waxes and solid paints. Apply over 50 F. Apply with sprayer. For exterior concrete, you may use a medium nap roller. For smooth concrete you may use short nap roller and cross roll. Thoroughly saturate surface. Applies at 200-300 feet per gallon depending on substrate. Apply additional coats for increased gloss.